Today's prisoner is Ivan Depestre Fernandez. Almost a year ago, on July 30, 2013, Fernandez was arrested and later convicted of being a "pre-criminal social danger" -- the Orwellian pre-crime the regime frequently uses to target its opponents -- and sentenced to 3 years in prison, according to the human rights commission. Ivan, who is approximately 40 years of age, recently joined the public opposition on the island, specifically the Orlando Zapata Tamayo National Civic Resistance Front and the group Awakened Youth. He was arrested by the political police on July 30th when he participated in a protest march in the city of Placetas, Villa Clara in honor of a fallen patriot, Frank Pais, along with other dissidents. The authorities kept him detained and quickly sentenced him on August 2nd to a 2 year prison term in the Municipal Tribunal of Placetas. During the ‘trial’, Fernandez Depestre was accused under the ‘Pre-Social Dangerousness Law’, which could dictate time behind bars for any citizen just because the authorities think that person would be a danger in the future. 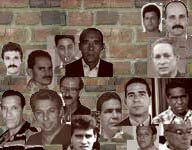 The law has been used to send thousands of Cubans to prison without having had committed crimes, and it is specifically used against dissidents, especially young ones. Jorge Luis Garcia Perez ‘Antunez’, former political prisoner and leader of the OZT Front, has been reporting about this case and has asked for more solidarity with the jailed activist. “Ivan Fernandez Depestre committed the horrible crime of daring to go out with other pro-freedom activists this past 30th of July in a peaceful march, dressed with their clothes backwards, paying tribute to Frank Pais on the anniversary of his death“, declared Antunez in an audio published on his YouTube account. The dissident leader added that the only detainee that day was Fernandez Depestre, explaining that the activist does not have family support and that his sentence was a method used by State Security to try and make him give up on his recently begun struggle. Fernandez Depestre has been participating in numerous pro-freedom demonstrations in the city of Placetas during the months of June and July. He has been detained and beat by the political police on various occasions.